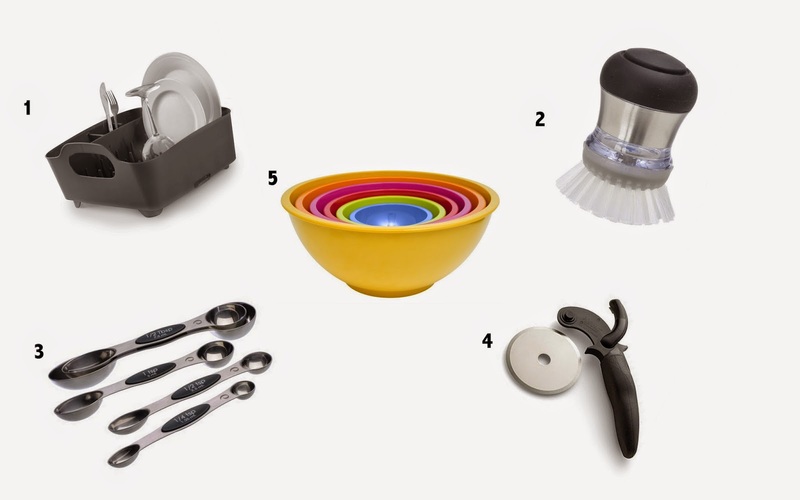 When it comes to choosing kitchen tools, usually, I am a loyal follower of anything America's Test Kitchen recommends. I love reading about the paces they put blenders through and which food storage systems are shatter proof. Our wedding registry was very literally organized around their suggestions. The tools they recommend have served us well, and I've neither wanted nor needed to replace any of them. But as I look around my kitchen, there are a few loves of mine that aren't straight from the ATK annals, so that's what I'm sharing with you today. Our last dish drainer was the pits. When it wasn't collecting water underneath its rubber mat, it was draining onto the floor. Super helpful. Enter the Umbra Tub Dish Drying Rack. The tub's drain is actually set high enough, that it can, you know, drain into the sink. The tub itself is dishwasher safe so if it gets groddy, into the bottom rack it goes. And best of all, it's only one piece, so someday, when it's not perpetually full of bottle parts, it will easily slip into the under sink cabinet when I'm not using it. My husband has a soap problem. No amount of referencing my college microbiology class will convince him that more is not always better with soap. He remains convinced that a thick layer is always preferable to a film. But should I really be complaining? After all, this does mean he is doing the dishes. Between the need to curb his soap habit, and my hatred of sponges that always always mildew, this dish scrubber solves most of our problems. If it could solve the problem of dishes all together, it'd probably cost more than $9.99. Magnetic measuring spoons. Need I say more. No annoying rings that you'll never put the spoons back on anyway and yet they still all stay together. The narrow ends are just the thing for reaching into spice bottles. We used to have a a magnetic set that was plastic, not of the same brand, but the tablespoon melted when I poured hot bacon fat into it. The nerve. Anyway, these metal ones won't melt and they're sleeker too. This was a wedding gift. For the first few months, we were convinced that it was broken since the arm kept flipping up. But then, when we discovered that it would flip back down too, we realized it was a feature not a bug. The wheel blade is removable for easy cleaning and sharpening, not that we've needed to sharpen it, but we could if we wanted to I guess. Best impulse Costco purchase ever. I am absolutely positive these used to be cheaper. Crate & Barrel used to sell them too. Until we amass the inevitable hoard of plastic kids' dishes, these are our only unbreakable dishes besides tupperware, baby bottles, and one cup the previous owners left behind. They're great to use as casual serving pieces, chips and guacamole anyone?, for mixing up cake batter, or for playing. The smallest bowl in our set is purple and it's always the most popular toy if there's a little girl over to play. Links to Amazon are affiliate links. If you purchase anything, I'll get a small percentage. Thanks! I am in the market for some new measuring spoons so I will definitely check those out! Also, I love America's Test Kitchen. Every recipe of theirs that I have tried has turned out great. And I love the back covers of Cooks Illustrated and have even framed some as art for my kitchen! We LOVE our magnetic measuring spoons. And magnetic measuring cups too! Genius. If anyone's looking for the cutco pizza cutter, or cutco anything for that matter, shoot me an email at baldwin4heisman@gmail.com.